I really enjoyed staying here! The best thing was that it was quiet. This is hard to find in glorious Buenos Aires. I also enjoyed the feeling of spaciousness and the lovely big bed. The mezzanine is a clever conversion, giving a large living area below and place upstairs for yoga as well as a dressing room. The location suited me fine. There is a supermarket next door and many restaurants nearby. The 126 bus took me to most of the tango venues I love and nearby Independencia Subte station gets you to town or up to Palermo in a jiffy. As a break from the city, it's lovely to walk down to Puerto Madero and the Costanera. The agency staff were quick to attend to anything I needed and were very helpful. I would book this apartment again. I stayed in this apartment for 3,5 months with my boyfriend while studying spanish in BsAs. When googling places to stay in BsAs, we came across Casa San Telmo which was in the business of anything from short-term to long-term rentals, and found some very nice apartments here. After deciding on this one, the entire process of reserving it went like a breeze, and the communication with the office was quick and helpful. After moving in to the apartment, we really had nothing more to do with them, but instead contacted the owner, Tobias, if there was anything we needed or anything that wasn't functioning properly. And ladies and gentlemen, a more serviceminded and helpful landlord is not to be found! There are quite a few porteños who could benefit from learning a thing or two from Tobias. We could contact him any day of the week, seemingly any time of day as well. He was so understanding, sympathetic, practically oriented, talkative and just plain nice that the entire stay was just a dream! Whenever something critical needed fixing, like the air-conditioning being broken, or the installation of a new safe, or the maid being told what to do, or the electricity had gone, or the gas-tank was empty, he was on it straight away, and did not let us wait for days on end as I have experienced other landlords do to us elsewhere. Although he was a bit slower on the less critical things (like the leak in the kitchen, or fixing the loose planks on the floor, or installing a coat-hanger, or fixing the shelf in the kitchen) it really never bothered us that much, because the apartment was so beautiful, and everything essential to our stay worked so perfectly. A big thanks and a huge hug to the best landlord anyone could dream of! As for the apartment itself, it is situated in the beautiful barrio of San Telmo, with its colonial buildings, stereotypical porteño-cafés, butcheries, sunday-markets and lots of history. It's a bit sketchy at night, I must admit, but as long as you're streetsmart, no one's going to touch you. Me and my boyfriend didn't experience anything unpleasant in ou neighborhood during our 3,5 month stay, so there's no reason to feel unsafe. The apartment is furthermore next-door neighbor to a super-market, a laundry-service, a Peruvian restaurant and a small kiosk, so everything you desperately need is within a 20 meters radius, and everything else is just down the street. The old market is four blocks down, the sunday Plaza Dorrego market is 4 blocks down, a nice hotel (Dandi) that offers private and group-tango classes is 1 block down, and a subway station which takes you to the rest of BsAs is 3 blocks down, so the location couldn't be better. The apartment has all the facilities and equipment that you need for longer stays. We did have to buy in a few things, like knifes and forks and different types of kitchen equipment, and when we asked Casa San Telmo to buy it for us, as we thought it was their responsibility, they felt it sufficient to supply us only with 4 knifes and 4 forks and 4 spoons, which we felt was a bit cheap, as they advertise the apartment as fully equipped. However, we just ignored them and bought everything we needed ourselves, and when we left the apartment, it had most of the things one needs to cook breakfast/lunch/dinner for longer periods of time. One has to remember that this is BsAs, and that things don't function as properly as, say, in Europe or the US. The electricity went out of our entire building several times during the stay, and one time the water went out for 2 days as well, which was a bit of a pain, but that is every-day stuff down there, so don't let that scare you. All in all, our stay was absolutely fantastic, and we got to live the dream that we had in mind when deciding to go; living in a rustic, beautiful colonial-style house, eating prime steaks with excellent red-wines late in the temperate evenings, going to tango-classes and milongas, sipping cortados and eating a medialuna in 150-year old cafés while watching the busy people of the city pass you by. I have only one thing to say to future residents: GO! 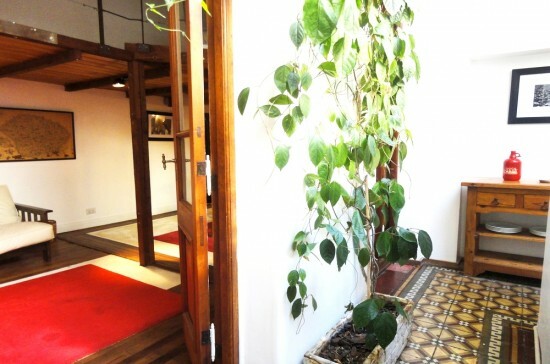 I loved staying in our San Telmo Apartment: original decor, very spacious and central to all the important sites. We walked everywhere in Buonos Aires. What a pity we couldnt take up the owner's offer to take us to Tango because we had a tummy bug. everyone in the office was friendly and helpful, even organised a taxi to the airport. Thank you for your hospitality, Angelika. Apartment was ideal, it's well located and has loads of bars and restaurants in the area. The apartment itself was very spacious and comfortable, love the woodish style. Good place to stay in Buenos Aires, casa vieja hermosa y buena onda para vivir! I really enjoyed my stay here. The apartment was well equipped and conveniently located. The Internet was reliable, which is a very rare thing in BA. The unit is off the street which I did not realize was such a blessing until I moved to the Microcenro. At night it's very quiet and cozy. The neighbors were all very nice and the building superintendent cleaned the hallways and entrance daily. The unit itself was charming and rustic with a lot of space. The doors and floors were rich old wood and you can't help but think of the years and lives that have been spent there. There is a 'column' in the center of the unit where light and fresh air comes in and there is a beautiful vine that grows in the hallway and around the windows. Next door is a chino supermercado and a laundry and the subte (subway) is just a few blocks. San Telmo is great! I heard that it was a 'scary' part of town but downtown seemed way more sketch to me. The people were all friendly to me on the streets and in the shops nearby.